Martin Seligman revised his authentic happiness theory, which was based on positive emotions, engagement and meaning. New theory of flourishing is built upon positive emotions, accomplishment, positive relationship, meaning and engagement, which all constitute the foundation of positive psychology. Each element contributes to well-being, but doesn’t not define well-being. Aristotle thought that all human action was to achieve happiness, Nietxsche – get power, Freud – avoid anxiety, Thales -everything is water, Seligman – wellbeing. The dominant popular connotation of happiness is related to cheerful mood, but not all people strive to be cheerful. Life satisfaction holds too privileged a place in measurement of happiness. It turns out that life satisfaction does not take into account how much meaning we have or how engaged we are with the people we love or how engaged we are in our work. Life satisfaction essentially measures cheerful mood, so it is not entitled to a central place in wellbeing theory, that aims to be more than a happiology. Positive emotion, engagement and meaning do not exhaust the elements that people choose for their own sake. What you choose must serve no other master. Senia (Seligman’s student) asserted that many people live to achieve, just for achievement sake. Relationship, meaning and accomplishment have both objective and subjective components: not just how you feel about your relationship, but how these people feel about you, not just your sense of meaning (you could be deluded), but the degree to which you actually serve something larger than you are, not just your pride in what you have done, but whether you actually met your goals, and where this goals stand in their impact on the people you care about and on the world. If people cared about not only their own happiness, but happiness of others, which would be part of their objective wellbeing, we would not have greedy financial executives, who are responsible for recent financial downturn. It comes to ethics versus your own values. Seligman says that happiness, like GDP, is inadequate in measuring wellbeing. It is a subjective target. Styles of responding: from active constructive, passive constructive, passive destructive to active destructive. Practice writing down your own response for the next time you have to interact with others and analyze it, create an active constructive one. Then use it. You just need to make it a habit. Losada effect: you should have 3 times more positive thoughts than negative. To achieve it, use positive psychology techniques, including Love letter, gratitude journal, etc. Find your signature strengths and set goals, or invent activities to practice them, write about your experience. Reasons why optimists are less vulnerable to disease: Optimists take action and have healthier lifestyles. Optimists believe that their actions matter, whereas pessimist believe they are helpless and nothing they do will matter. Optimists try while pessimist lapse into passive helplessness. Optimist use more social support. Optimists have a better response to repeated stress. Become an optimist! Variety of programs are designed and already being used to help people balance their life with flow, meaning and pleasantries. Original Penn Resiliency program is one of them. It was later modified to work for school children (The Geelong Grammar School Project). It would be great if all schools offered it. Special program was created for US Army soldiers: Comprehensive soldier training/fitness; Global Assessment tool (GAT) has four sections: Emotional fitness module, Social fitness, Family fitness, Spiritual fitness, and the main component of the program is Turning trauma into growth. Overview of Positive Psychology Training (14 sessions): Identify your strengths and illustrate how they are used in your life. You can complete VIA questionnaire online to identify character strengths. Start a blessing journal, in which you write, every night, three good things that happened that day. Understand the role of good and bad memories in maintaining depression/unhappiness. Write about feelings of anger and bitterness and how they feed your depression. Write a forgiveness letter describing a transgression and related emotions and pledges to forgive the transgressor (only if appropriate) but don’t not deliver the letter. Write a gratitude letter to someone you never properly thanked for and deliver it in person. Understand terms satisficers and maximizers, find ways to increase satisficing and devise a personal satisficing plan. Use optimistic style – to see bad events as temporary, changeable and local. Recognize character strengths of significant others, ask family members take VIA questionnaire online and then draw a tree that includes the character strengths of all members of the family. Learn savoring as a technique to increase the intensity and duration of positive emotion. Give the gift of time by doing something that requires a fair amount of time and calls on your character strengths. Make sure you know how to have full life integrating pleasure, engagement and meaning. Be future oriented, not dwell on the past, work for your ideals. The universal truth we have all experienced is people interpret the same objective events around them based on their own personal values, biases, selective attention, and sense of identity. How we interpret the world around us plays a large and important role in how happy we are. Scientific explanation of why people are incapable of taking in the whole picture: Our brains are information processors and the world is just too full of stimuli to effectively take it all in. From the movie What the Bleep do we know – we can only process ½ of all we see. And even what we see we interpret in our own way, based on our assumptions and values, which may not be true/valid. We pick and choose what we pay attention to, and our brains are evolutionary adapted to do this well. We tend to be on the lookout for potentially harmful things, are adept at reading social cues and are pretty good at integrating sights, sounds, smells without even thinking about it. But then the world around becomes complex, we tend to narrow our attention to the things that matter (up to the limit we can understand). The focusing illusion occurs when one fact about a choice particularly stands out in our minds, so much that we tend to overlook other important characteristics. Divorced woman is only a part time divorced woman as the rest is a shopper, an employee and a friend. We are full time something only if we choose to dwell on it. Pathetic fallacy happens if you think that all poor people are unhappy, but forget that they have families, friendships, love lives, etc. Change blindness occurs because people have tendency to encode things by broad category rather than any detail, as a means of simplifying complex information. We seem to notice general information during transactions, but not specific characteristics of a person if they aren’t relevant to the transaction. Many things to us are broad categories, such as that person is an employee, Australian, female, young, and then complexity is noticed when we get to know them better. You can get around not seeing the full picture by talking to others and benefiting from their experience. You can do more research to learn about other people’s perspective online or from the books. 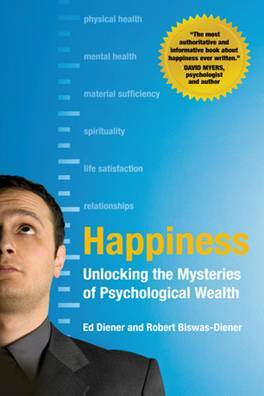 I just finished reading Happiness: Unlocking the Mysteries of Psychological Wealth book by Ed and Robert Diener. I find it the most entertaining and comprehensive books on happiness so far. The book describes psychological wealth, which includes life satisfaction and happiness. Even though I don’t agree with certain statements in the book, I’d like to point out some highlights. Many people believe that their work is a drudge and their leisure is fun. But some activities are work for some and leisure hobbies for others. NBA players do for work what most of us do for fun – play and watch basketball. What farmers do for work, most of us do for fun – gardeners and hobby farmers. There is no clear line on what is work or leisure. Think about your job as something enjoyable half the battle. If you are not enjoying your job, perhaps you need to change job or change your attitude towards you job. Even if robots take over our chores, we will still do things we like to do. When I was unhappy with my job, I couldn’t imagine what other job I could get to be happy. I feared that I will not be able to find anything better, but only worse, until one day I said to myself it is not about what I know or believe right now , not about being able to find a better job, it is about not being miserable now. I just didn’t see the point in living my life doing that job. It was the source of unhappiness for me and I decided to stop it. There is misconception that some people complain no matter where they work. Not entirely true. People do find better jobs. I finally found the job I really like. When people are the most happy at work, they like what they do and they can do it the way they want to do it, they utilize their core strengths and perceive their jobs meaningful. Authors conducted a survey of 100 millionaires, out of which only 49 responded, 47 out of those said they were satisfied with their lives. It is possible that the rest 51 didn’t respond because they are not satisfied. But what is really important those who are satisfied said that they are happy not with the money itself, but pleasing family relationships, helping the world, fulfillment and pride from their work and accomplishments. So it is more about what you do with money than just having it. Individualistic societies tend to suffer from more social ills, such as divorce, suicide and homelessness while people in collectivistic societies can feel frustrated by their personal sacrifices. Take a moment and consider an unfinished sentence: “I’m…” What is interesting, in collectivistic societies people tend to finish it with words as roles like mother, woman, human, student, but in individualistic – with personal descriptions like hard-worker, beautiful, etc. In some cultures emotions, feeling, thoughts are not as important as actions or relationships. In Asian cultures happiness is more of a calm feeling of contentment compared to excitement in western countries.